Learn to track African wildlife on foot and during game drives. See the awesome Victoria Falls, one of the world’s biggest waterfalls. Enjoy a scenic sunset boat ride on the Zambezi River and keep an eye out for wildlife along the banks. 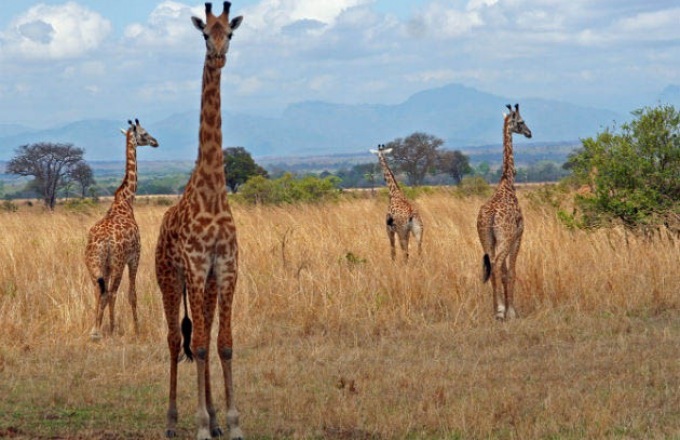 Three generations learn about wildlife, culture and human history of Africa together through field trips, game drives, walking safaris and fun activities. Search for the Big Five (elephant, lion, rhino, Cape buffalo and leopard) and many other fascinating creatures in the wilderness. Learn the skills needed to survive in the African bush and meet the elephants saved by a rescue operation up-close. Afternoon: Depart from North America on overnight flights to Johannesburg, South Africa. Refer to your personal air itinerary for specific flight information. Activity note: Hotel check-in from 2:00pm. Dinner: At the hotel, enjoy a buffet welcome dinner including a starter and entrée with side dish; a welcome drink, bottled water and coffee/tea are provided, with other beverages available for purchase. Evening: Orientation: The Group Leader will greet everyone with a warm welcome and lead introductions. We will review the program theme, the up-to-date Daily Schedule and any changes, discuss logistics, safety guidelines, emergency procedures, roles and responsibilities, and answer any questions. We have set aside some free time in the schedule for your personal independent exploration. Please note that program activities, schedules, and personnel may need to change due to local circumstances. In the event of changes, we will alert you as quickly as possible. Thank you for your understanding. We are fortunate to have as our Group Leader a knowledgeable expert who will also serve as our primary lecturer for most of the program. Game drives typically last between 3 to 4 hours in the early mornings before breakfast and late afternoons, when the animals are most active. Continue getting to know your fellow participants, settle in, and get a good night’s rest for the day ahead. Morning: Boarding our motorcoach, the morning excursion will bring us to Soweto (SOuth WEstern TOwnship), the largest black residential area in South Africa, where we will explore the area with commentary from a local expert; we will have the opportunity to get off the coach and explore on foot at some locations. This “city within a city” consists of 50 suburbs, or sections, and essentially acts as a labor reservoir for the greater metropolitan area of the Witwatersrand. In many ways, the story of Soweto is the story of South Africa. The visit includes major points of interest, such as Chris Hani Baragwanath Hospital, Baragwanath taxi rank, Freedom Square and Hector Peterson Memorial. Over the course of the day, we will discuss the history of South Africa and apartheid, which will constitute today's class. Lunch: At a local restaurant in Soweto, enjoy a buffet featuring a variety of dishes including soup, salads, local dishes, desserts, plus water; other beverages available for purchase. Afternoon: After lunch, we will transfer to the southern edge of Johannesburg to visit the award winning and internationally acclaimed Apartheid Museum, where our local expert joins us for a walk through the museum with interpretation of exhibits. This beautiful museum gives a balanced account of 20th century South Africa. It recounts the political upheavals beginning in the last century and moves on to the transition from a racist state into the new era of hope and freedom as a democracy. At the end of the afternoon, we will return to the hotel with time to freshen up before dinner. This beautiful museum gives a balanced account of 20th century South Africa. It recounts the political upheavals beginning in the last century and moves on to the transition from a racist state into the new era of hope and freedom as a democracy. Transfer back to the lodge. Dinner: Taken at the lodge. Activity note: Drive time to De Wildt Cheetah Centre is 1.5 hours; from De Wildt to Plumari Game Reserve is 1 hour. The beginner bush skills course consists of walking in the bush, on potentially uneven ground. The pace and distance covered during the course are gentle, and are dictated by the group's abilities. If you are unable to participate, you have the option of remaining at the lodge to enjoy the scenery. Breakfast: Taken at the hotel. Morning: After breakfast, we will check-out of the hotel and travel by coach to the De Wildt Cheetah and Wildlife Centre, which has gained international recognition for bringing the cheetah back from the brink of extinction through its captive breeding programs. Our visit of De Wildt will be with one of the center’s enthusiastic researchers, who will provide insight into the long term conservation of the African cheetah. In addition, we will learn about the efforts that the center is making toward the conservation and reintroduction of other species, including wild dogs, brown hyena, antelope and Cape vultures. Lunch: Boxed lunch provided, eaten at the center. Afternoon: After lunch, we will re-board our motorcoach and drive to Plumari Game Reserve. After arriving, we will embark on a beginner bush skills course within the Reserve, in the company of a local expert. This hands-on, interactive course is designed to give a basic understanding of the African bush and the skills needed to survive there. During the gentle walk in the bush, we will discuss and experience: how to navigate by day or night; survival skills such as walking techniques and use of terrain; how to interact with dangerous and/or useful animals such as snakes, insects, birds, fish, etc; how to track animals; useful plants and herbs; location and procurement of potable water and edible food; basic first aid; medical dangers such as malaria and bilharzia (schistosomiasis); communication skills needed for survival in the bush; equipment one needs in the bush; and what materials occur naturally in the bush that one can use to survive. The course is designed with safety at the forefront; at no time will we be put in dangerous situations, nor will we come into contact with dangerous animals. Plumari Game Reserve sits beneath the Magaliesberg mountain range near Johannesburg, providing an awe-inspiring wilderness setting nearly 12 square miles in size. Here, one finds a pristine African bushveld with an abundance of wildlife including the Big Five (rhino, buffalo, elephant, lion and leopard; leopard may be hard to spot), as well as hippo, giraffe, zebra, waterbuck, and wildebeest, to name a few. There are also over 350 species of bird resident to this area. Dinner: Dinners at the lodge vary between buffets and a la carte choices, but always include a starter salad, main entree and side dish, and dessert; water is provided, with other beverages available for purchase. Breakfast: Breakfast at the lodge consists of a buffet with various bread and cereal options and fresh fruit with hot items cooked to order; coffee/tea, fruit juice and water included. Morning: Early this morning, we will embark on an interpretive game drive in search of the wildlife on the reserve, each vehicle with its own safari expert. Our local guides provide insight into the animals and birds spotted during the drive. Lunch: Lunches at the lodge consist of light meal choices ordered off of a pub style menu. Water provided with other beverages available for purchase. Afternoon: In the early afternoon, our Group Leader will give us an introduction and overview to common predators found in southern Africa. Afterward, we will take a game drive in search of wildlife not spotted this morning. Activity note: Bush walk is over uneven, dirt ground and involves inclines/declines; exact route and length are dependent on group's ability. Morning: This morning, we will be led by a local ranger on an interactive and interpretive experience with trained elephants. We will view the elephants up close as well as touch and feed them, while the ranger discusses elephant behavior and social structure. Afternoon: This afternoon, we will have the choice of either taking a game drive or going on an interpretive bush walk, which will focus on animal tracks, plants and insects; both activities are led by our local safari rangers. Activity note: Drive time from Plumari to the airport is 1.5 hours. Flight from Johannesburg to Kasane is 1 hour 40 minutes. Drive from Kasane airport to the boat dock is approximately 15 minutes and from the boat dock to campsite is approximately 45 minutes. Morning: After breakfast, we will board our motorcoach and transfer to the Johannesburg O.R. Tambo International Airport, for departure on our commercial flight to Kasane, Botswana. Lunch: On board the flight. Afternoon: Upon arrival in Kasane, we will clear Botswana immigration before being met by our local safari experts for a short transfer in open-air safari vehicles to the boat launch, for our game-viewing boat cruise. We will explore the Chobe River by motorboat in the company of a local wildlife expert, where we may come face to face with the elephant and buffalo that gather on the banks of the Chobe River. The Chobe River is one of the few rivers in the world that can flow in either direction depending on the seasonal floods! We will immerse ourselves in the unique riverine environment, viewing numerous birds including sacred ibis, blue heron, goliath heron, saddle-billed storks, marabou storks and little egrets. Upon conclusion of the cruise, we will transfer in our safari vehicles to the mobile tented camp, located just outside of Chobe National Park. We will take a moment to settle into our tents before our Group Leader gives us an overview of the history and culture of Botswana. Dinner: Camp dinners are buffets with a starter, main entree with side dishes, and a dessert; bottled water and soft drinks are included, with alcohol available for purchase. Breakfast: Breakfasts in camp are buffets with cold cereals, bread, fresh fruit and rusks; coffee/tea, fruit juice and bottled water provided. Morning: This morning, we will depart on an early-morning game drive in Chobe National Park in search of any lion or leopard kills made during the night. We will travel through the plains in search of predators and other game. Chobe National Park remains one of Africa's prime game-viewing areas. Here one finds all of the "Big Five" except rhino. Rare antelope also inhabit the region. This is elephant country, home to the largest population of elephants in the world; many of these great grey giants can be seen at this time of year. (Note: seasonality makes a big difference in how much game you will see. If it's dry you will see larger herds; if it has recently rained the animals will be more dispersed). The park forms part of Botswana's northern-most border and is a contrast of desert aridity and flood plains. The Chobe region is best known for its vast magnificent river and floodplains filled with grazing herds of big game. Buffalo, sable, lion, leopard, hippo, hyena, and thousands of antelope all find safety in this huge national park. This is one of Africa's most pristine ecosystems and greatest wildlife refuges. After the morning game drive, we will return to camp to enjoy mid-day at leisure. Afternoon: The early afternoon is at leisure to rest and read in camp. Following afternoon tea, we will embark on a game drive in the park searching for herbivores, carnivores and omnivores. Evening: Following dinner, we will have the opportunity to join together around a campfire. If the skies are clear, our Group Leader will point out constellations of the Southern Hemisphere. Morning: This morning, we will venture on an interpretive game drive in Chobe National Park. We can keep track of the amazing wildlife that we see with our pocket-sized wildlife checklists! Afternoon: Mid-day is at leisure to enjoy our final afternoon at camp. Our Group Leader will give a lecture on termites and their role in the ecosystem. In the late afternoon, we will take one final game drive in search of wildlife that has eluded us thus far. Activity note: Total transfer time from camp to Livingstone can be up to 2.5 hours depending on border formalities. Morning: This morning, we will say goodbye to our safari hosts and transfer by open-air safari vehicles to the Kazangula border. Here, we will take a five-minute ferry ride across the Zambezi River to Zambia. After clearing Zambian immigration, we will board an enclosed minibus for the remainder of the transfer to Livingstone and David Livingstone Safari Lodge. Lunch: Expansive buffet lunch featuring a variety of starters, main dishes, side dishes and desserts; bottled water provided with other beverages available for purchase. Afternoon: Free Time. Take this opportunity for personal independent exploration to see and do what interests you most. Please refer to the list of Free Time Opportunities. The Group Leader will be happy to offer suggestions. Before dinner, our Group Leader will give an overview on the history and culture of Zambia. Dinner: Dinners vary between plated, 3-course meals and expansive buffets featuring a variety of dishes. Bottled water provided, with other beverages available for purchase. Activity note: Walking up to 2 miles at Victoria Falls on mostly flat, paved paths. Transfer to the Zimbabwean side of the falls can take up to 1 hour with border formalities. Breakfast: Expansive buffet with a variety of breads, cereals, fresh fruits, pastries, cold meats and cheeses, and hot items such as eggs, sausage, tomatoes and mushrooms; coffee, tea, fruit juice and water provided. Morning: Our morning excursion will be to the nearby Tongabezi Trust School, commonly known as Tujatane, where we will learn about daily life in Zambia and have an opportunity to meet local students and teachers. Each generation will have an opportunity to interact with peers, whether through conversation or games. Afterward, we will visit Livingstone town, a classic colonial town of former Northern Rhodesia, with commentary from our Group Leader. We will visit the Livingstone Museum to learn about David Livingstone’s explorations and discoveries. Displays include letters, notes and other artifacts that belonged to David Livingstone. We will also visit the local market to see how Zambians subsist, and learn about local industry. A visit to a superb crafts market introduces us to artisans and provides an opportunity to learn how the crafts are made and marketed. We return to the lodge in the early afternoon, for the mid-day at leisure. Afternoon: Following lunch, we will transfer by minibus across the border to visit Victoria Falls from the Zimbabwean side. Upon our entrance to the park, we will walk along the path with commentary from the Group Leader about the formation of the falls, as well as the local flora and birdlife seen. Since the waterfall spans the border between Zambia and Zimbabwe, it is visible from both countries, but the majority of the water falls on the Zimbabwean side. Viewing the Falls from this side provides numerous overlooks and truly gives us a feel for the full majesty of this natural wonder. After crossing back into Zambia and on to our lodge, our Group Leader will give a lecture on Dr. David Livingstone's explorations and discovery of Victoria Falls. Activity note: Walking in the village on flat ground with extended periods of standing. Climbing and descending approximately 150 steps one way at the Falls; pathways may be wet and slippery due to waterfall’s mist. It is possible to see the waterfall from one viewpoint without climbing all the stairs. Morning: Our morning visit to the Mukuni Village will give us more cultural insights as to how locals truly live. We will learn the deep history of this village and the surrounding area, as shared by a local resident who leads us through the village. We will interact with villagers as they invite us into their homestead and tell us about the methods in which these traditional huts are made and decorated. We will finish our visit at the chief’s residence, where the royal family’s history and village politics are explained. Before departing, we will meet with wood carvers and other artisans at the local market. Our morning will end with a visit to the famed Victoria Falls, one of the Seven Wonders of the World. Victoria Falls is where the Zambezi River opens out into an extravaganza of roaring, spray-tumbled water, known to the locals as “Mosi oa Tunya” (the smoke that thunders). Few sights are as awe-inspiring as when the ground rumbles with the forces of the water. We will view the Falls this morning from the Zambian side, wandering the footpaths through the rainforest en-route to the various viewpoints. Afternoon: This afternoon, we will transfer to the waterfront for our private sunset boat cruise on the Zambezi River. We will search for game on the banks of the river as we enjoy a spectacular African sunset. Activity note: Flight time Livingstone to Johannesburg is 1 hour 45 minutes. Morning: Following breakfast, we will transfer to the Livingstone Airport for our commercial flight to Johannesburg's O.R. Tambo International Airport. Afternoon: Arrive in Johannesburg in the mid-afternoon and connect to your international return flight. This concludes our program. If you are returning home, safe travels. If you are staying on independently, have a wonderful time. If you are transferring to another Road Scholar program, detailed instructions are included in your Information Packet for that program. We hope you enjoy Road Scholar learning adventures and look forward to having you on rewarding programs in the future. Please join our Facebook page and share photos of your program. Visit us at www.facebook.com/rsadventures. Best wishes for all your journeys! The Courtyard Hotel, a beautifully appointed, Tuscan-themed hotel, is located only 15 minutes from the Johannesburg OR Tambo Airport in a very secure area. The hotel overlooks a landscaped greenbelt with walking path. The Eastgate Shopping Centre is nearby, hosting many shops and restaurants. There is a complimentary shuttle to the shopping center offered between 7:00pm to 10:00pm each evening. Located in an historic area with beautiful mountain scenery, Askari Lodge offers comfortable accommodations with the chance to view the Big Five (rhino, lion, elephant, buffalo, and leopard, although leopard are hard to spot). Each chalet has a thatch roof and wooden patio, and is equipped with modern amenities. All chalets have an attached bathroom with a Victorian bath and shower. The rooms are furnished with antiques to complement the theme of the entire lodge. An authentic, tented safari camp is set up in a private location with Hemingway-style safari tents. Each tent has two or three beds with linens and an attached bathroom with chemical toilet. All meals are taken in casual safari style near the campfire and shaded by many large trees. The David Livingstone Safari Lodge commands prime river-front property on the Zambezi River. The open-air floor plan of the main lodge affords views over the river, while the beautiful teak-wood finishes and doors highlight the lodge throughout. Each room has a lovely, en-suite bathroom and private patio or deck with views of the river. The lodge’s restaurant and lounge offer fine dining in a relaxed atmosphere, with the option of dining on the extensive teak deck along the river. A local of northern Zimbabwe, Keith Chisnall relishes in showing the bush culture to travelesers from around the world. As a child, Keith learned the medicinal value of bush plants, how to track animals, tribal customs and the indigenous flora and fauna, and his knowledge has only grown since then. He’s worked as an engineer, salesman and detective, but his most meaningful work has been in leading educational adventures. After over 20 years of experience leading groups in “Big Five” territory, you can rely on Keith to explain every aspect and every detail of the wilderness!